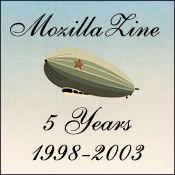 As you may have guessed from MozillaZine's retro look, today is our fifth anniversary! The site has come a lot further than any of us could imagine since 1998 and we would like to thank everyone who has supported us over the past half decade. We've prepared a special fifth anniversary section for you to browse over. We've enjoyed being at the heart of the Mozilla community and look forward to making MozillaZine even better as we head into the future. We hope you'll join us. MozillaZine rules. Go for another five! Nice work, everyone! Obviously this could not be down by the webmasters alone, a big thank you to all the users that contribute with technicla help and usefulness, good humor, and friendliness. Long live MZ! Congrats all of you, Mozilla is better than ever, and most of it is thanks to the community! It's been 5 years for me too! On the web that is. In our times that's almost like 50 huh! Congratulations, guys. I visit MozillaZine on a daily basis for a very long time now, and I fully expect to do so over the next five years as well ;). #6 Chris, Jason, and Alex - Thanks! very nice! is it permanent? Happyness still can be found and technology and open source community. Congrats, happy birthday and all this sort of things!!!! Congratulations :) I hope to keep reading for a few years more. I still dont know what mozilla is. I Have been reading this site since the very beginning. Used nearly ever binary built. (even the aborted 5, and Raptor)..
Congrast to the admins, and kudos to all those like me, who for the last 5 years, had the belief Mozilla WILL succeed, despite the naysayers. Doesnt it feel like you drank all the cream, when you see news sites praising Mozilla, calling it a success, when the same were critisizing it just two years ago. JWZ, Andreesen, you left the party before it started. Quite honestly, the retro look is cooler than today's look. It mixes quite well with Mozilla's home page too. Let's not change it back, I say! #19 Welcome to free captialism. Red and orange IMHO should be used sparingly on the internet...to my tastes these colours make the site look amaturish and less professional. The "pastel shades" of green used are much better. The colours don't take front seat over the text, which is the most important aspect here. Lokk at many popular sites set up by large companies on the internet, and unless they are aimed ata specific group such as 13-20 year olds as an example, are not designed with bright colours. Red and orange are birht colours. At these sites the colour doesn't take over the content. In my opinion, the red and orange colour theme seriously detracts from the content. #20 BTW My typo "birht" should be "bright"
Happy Birthday Mozillazine! !, thanks to all for the superb work. First: Congratulations on all the work that has gon into this site and all the news which has been dissemination by mozillaZine about the Mozilla project. Now some of my comments about the <b>MozillaZine is Five</b> article. Once again people working with Mozilla are helping to forge forward with what I believe was an early principle for internet. Many early internet pioneers believed that the internet should be a place for all and a place were information could be freely shared. Today this vison is under attack. Mozilla.org and MozillaZine are at the forefront of reversing this trend and returning the internet to its original vision. Kudos to all at Mozilla. More and more companies and individuals are beginning to realize the liability of using IE. People may see both Bill's and Steeve's mouth moving as they state <b>security is our number one priority</b>. In reality people are left with computers which are attacked, almost weekly, with viruses which cost businesses millions of dollars. People (this includes those working in professional IT departments) are reading reviews of current browsers in mainstream publications as well as more technically specific publications. Mozilla consistently is shown to be one of the best browsers advailable and usually is ranked higher than IE. I believe the next phase for Mozilla could be a strong marketing phase. Mozila.org could find ways to let potential users (corporate as well as individual) know the benifits of using Mozilla. Mozilla.org/Mozillazine could provide information to show people how easy it can be to roll out Mozilla in an corporate setting. I believe some of this marketing is already ongoing and can only get better as people and corporations search for an more secure browser and email solution to IE and its weekly virus attacks. Since I have been testing and reporting bugs for Mozilla since Milestone 5 (using a Mac) when the browser would explode if the user so much as sneezed, I guess I will be here when the "MozillaZine is Ten" report is posted. Good work and thanks to all who have assisted with this most worthwhile project. You have all helped to make Mozilla into what I believe is the best browser/mail and news reader out there. Maybe this vision will soon begin to come to realization because of events beyond Mozilla. The EU is about to bring a final verdict to its antitrust trial with Microsoft. If the EU gets it right and manages to restore competition, Mozilla will face the added challenge as to how to fit into this new competitive world. We must be ready for this challenge and not be a "work-in-progress" if and when it arrives. Congrats on making it to 5 years. That's tough for any online zine. I hope you have many more years of articles, community, and service. "A site devoted soley [sic] to Mozilla news and advocacy." So, like everyone else, I'd like to thank everyone who donated so much of their time to furthering this wonderful project. 5 years of great work with great results. Thanks to the developers, who realy do a great job, and to all members of the community. I wish the Mozilla.org page was as pretty as either version of the Mozillazine.org home page. Personally, I prefer the blue and green version to the orange and red one, but whatever Mozillazine ends up with I hope Mozilla decides to use the other (or even goes back to its old design). Actually it kind of seems to be still accessable at http://www5.localweb.com/fingerstyle/mozillaZine/index2.html but the mime types are all wrong and the SQL has all broken. #30 Your second URL crashes Mozilla! Don't click on the second url posted by SomeGuy as it will craxsh Mozilla 1.5b. BTW I am using Moz on MacOS X 10.1.5. #32 Re: Your second URL crashes Mozilla! Sorry if it crashed on you. It worked on my thing-a-majig (recent windoze nightly). Actually I do recall recently seing some problem with mozilla (windows) crashing when opening an open/save dialog like that but grabbing a newer build fixed that. Dont know off hand if there was a bug # for that, perhaps it is related. Wow, 5 years. Not to spoil the party fun, but don't ya just want M$ to bundle over and die right now?